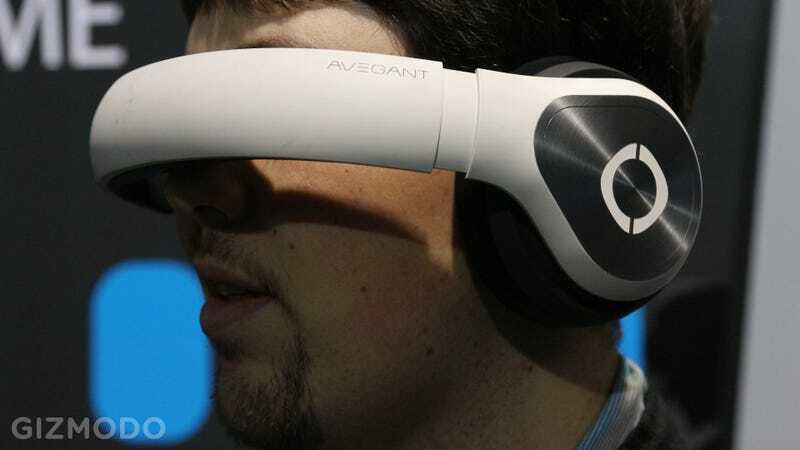 The Avegant Glyph is not a virtual reality headset. It's not pretending to be an OCULUS KILLER!!! or anything like that. But it does include two ideas that could make VR headsets way, way better. First, let me step back a sec. If the Avegant Glyph isn't a VR headset, why the heck is it on my face here at CES? Well, that's because it's a wearable 3D HDTV kind of like the ones you might have seen from Sony. Instead of transporting you to a virtual world, they show you the equivalent of a movie theater screen from the perfect seat in the center row. Only instead of looking like something out of Japanese anime, the Glyph looks like a pair of stylish, high-quality wired headphones. Which makes sense, because that's exactly what they are. Use 'em like headphones most of the time—people will assume you're just wearing some Beats knockoff—then pull the band down over your eyes once you're seated on the plane and no longer give a crap what other people think. That's an idea that I'd like to see VR headsets (and other wearables!) steal. Also, it's worth noting that the Glyph has a built-in battery good for about 3-4 hours of video or two days of audio on a charge, according to the company. But that brings me to the second thing Avegant does so well, the reason the optics can fit into a headband to begin with. Instead of using a big LCD or OLED screen, or even some microdisplays like the Sony headset, the Avegant uses digital light projection. It bounces light right off an array of two million micromirrors, right onto your retina. So instead of looking at magnified pixels on a screen just inches in front of your face, you're basically just seeing light. When I tried the prototype, I definitely noticed some issues—the blacks looked a bit grey, and there was some weird artifacting the company chalked up to firmware—but the images were bright, fairly clear, and didn't give me any eyestrain. The lenses are super easy to adjust to your eyes, too, with independent controls for focus and position for each eye. The biggest problem is ergonomics—how do headphones stay on your head if the headband is over your eyes?—but founder and chief strategy officer Ed Tang explained that not only will the final version be lighter (400 grams vs. 600 grams) but also have the weight shifted back towards the earpieces. The band will be adjustable so you can increase the amount of tension. Plus, the company's looking into maybe adding an additional strap to be safe. I just don't understand why Avegant isn't pursuing virtual reality if they've already come this far. When I ask, Tang tells me the technology's definitely capable of a wider field of view, but he just doesn't think there's enough VR content out there yet. He's planning to ship the final Glyph this fall for $600, potentially before VR even has a chance to become a commercial success.